The real-time Web is here. Google has officially jumped into real-time search, taking full advantage of its recent partnerships and changing the face of search engine optimization. Conduct a search on Google and you might now see a sizable part of the page dedicated to real-time search. This is a scrolling, live update of content from across the Web about your query and one of the most significant public-facing changes Google has made in a long time. It's also one of the biggest changes to SEO (as it applies to Google) in recent history. The real-time updates - or "Latest results" - take up a significant portion of screen space. After the sponosored listings at the top of the page, then the top organic result comes the real-time updates. In some cases, the box is also very close to the fold. In short, as it stands today, your company's organic listings might have already changed dramatically. While the total number of results does not seem to have changed, you might have dropped below the fold. That means checking your search positions immediately, and getting to work on improving them. 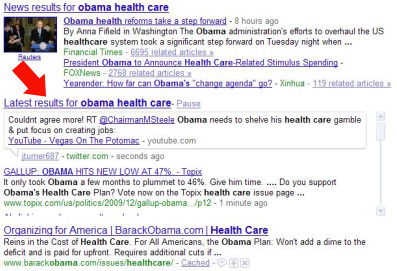 Below is a Google results page for "Obama health care." The first result is the top result, then you will see the real-time results. The bottom result after the real-time box is just above the fold. This is a hot topic, so keep in mind that not all queries will produce real-time results, or results will be ordered differenlty. For example, a search for "zhu zhu" (a popular toy this holiday season) shows real-time results, but at the very bottom of the page. Also impacting the position of real-time results and normal organic listings will be the number of paid search results. One thing is for certain - Web professionals' stock in Facebook, Twitter, MySpace, FriendFeed, Jaiku and Identi.ca just went through the roof. Those companies are now partners, waist-deep in the Google mix; and that's where many of the real-time results are coming from. In short, if you're not on some or all of these networks, it's time to get started. And you must go beyond just making a profile. These real-time results will take into account your social graph - the connections you make and your "authority" in the space, as well as the content you provide on these networks. We're talking quality here. Businesses must provide value to their social connections. For example, if you tweet an important piece of information and it gets re-tweeted by your followers, you can bet Google will take notice. Google will be examining accounts' social stock and including those in the updates - on the first page of Google. You will also notice that real-time results are not limited to social networks, but include blogs and other websites. Content creation and optimization (creative copy, keyword-friendliness, etc.) becomes a mission-critical business objective. It will also be interesting to see if these new partner networks get flooded with "content noise," once publishers realize the opportunity. It's quite possible the personal space users feel they have within networks like Facebook will be come serious spam magnets. Don't miss Website Magazine's February issue. Included is Dante Monteverde's SEO Corner, focusing on optimization for Google's Social Search and real-time results. Below is a brief video of Google's latest innovation. It's not hard to see the impact looming for Web professionals.